It’s Bout of Books time! Technically, we’re already 3 days in (depending on when I’m able to post this) because I haven’t yet gotten my act together in terms of posting updates. Daily updates are too much; I don’t have enough time to actually get anything done! So far, things are going pretty well. On Monday, I kicked off Bout of Books literally just after midnight by starting Witches of Lychford, which helped me get enough of a jump on things that I was able to finish it after work the next day. Kicking off the readathon by finishing a book (well, a novella technically, but still) on a day when I had to work was definitely motivating; I also started two other books (and by started, I mean barely started): The Female of the Species by Mindy McGinnis, which I have a hard copy of and also borrowed the ebook from my library to read when I’m on the go, and We Are Okay by Nina LaCour, which I borrowed from the library on audiobook. Tuesday was a super crazy day at work and I got home late, so I didn’t actually get any physical reading done. I did, however, listen to a bunch of We Are Okay on audio and got very drawn into the story and writing style. On Wednesday, my day off, I had a few things I needed to do (like work out and finally see the new Star Wars movie) but reading-wise, I was able to get through a bunch of The Female of the Species, which I’m really liking–the writing is strong and I especially love Alex, one of the main characters, who’s a very unique YA heroine. I also again listened to a chunk of We Are Okay while driving places and doing things around the house. Goals for the rest of the readathon: I’m really hoping to finish The Female of the Species before the weekend, although I’m not sure how realistic that is. My pre-order of Beneath the Sugar Sky by Seanan McGuire is due to get here on Friday, so I’m going to aim to finish that over the weekend. And I absolutely need to finish We Are Okay before my library takes it back in four days. How is Bout of Books going for you guys? It’s time for one of my favorite readathons–Bout of Books! I love Bout of Books because it’s low-pressure but usually does motivate me to read a lot more than I normally would in a single week. 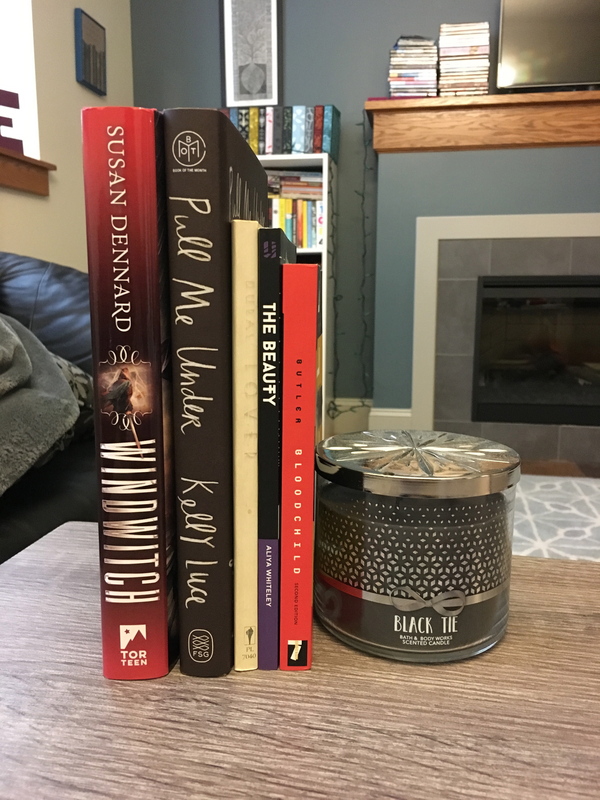 My TBR is a mixture of books I’m already in the middle of but don’t see myself finishing before the readathon starts, and some new, shorter books that I think will make for good readathon reads. I always like having a short story collection going during a readathon to help break things up, so The Dark and Other Love Stories by Deborah Willis should work well. I’ve read the first two stories so far and really enjoyed them; they’re stories focused on difficult relationships by a Canadian author. And I thought I’d still be reading If We Were Villains by M.L. Rio during this readathon since I’ve been reading it for the past week, but was able to finish yesterday. So instead I’m going to get started with An Unkindness of Ghosts by Rivers Solomon so that I can have a science fiction book to dip in and out of during the readathon; I’ve been craving some good SciFi for awhile. In terms of books I have yet to start reading, I’ve got a few really good options in mind. I pre-ordered Beneath the Sugar Sky by Seanan McGuire, which comes out on Tuesday the 9th, and I’m really hoping I’ll get it in time to read it for the readathon. Usually books from B&N don’t ship until the release date, so fingers crossed that it comes in by Friday or so. 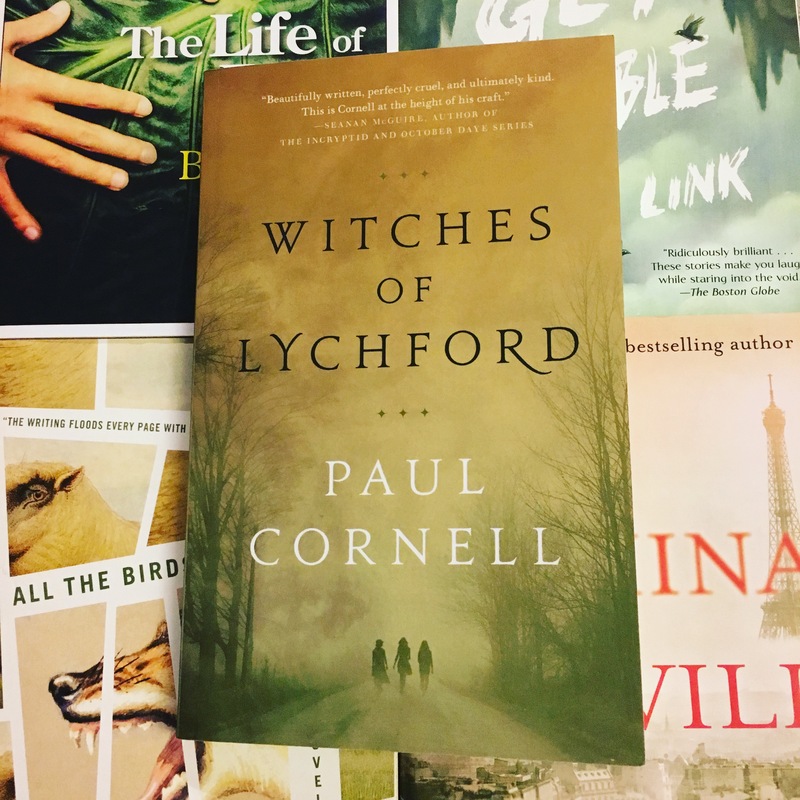 I have another Tor novella, Witches of Lychford by Paul Cornell, on deck in case it doesn’t, or in case I’m in a very fantasy novella-ish mood. 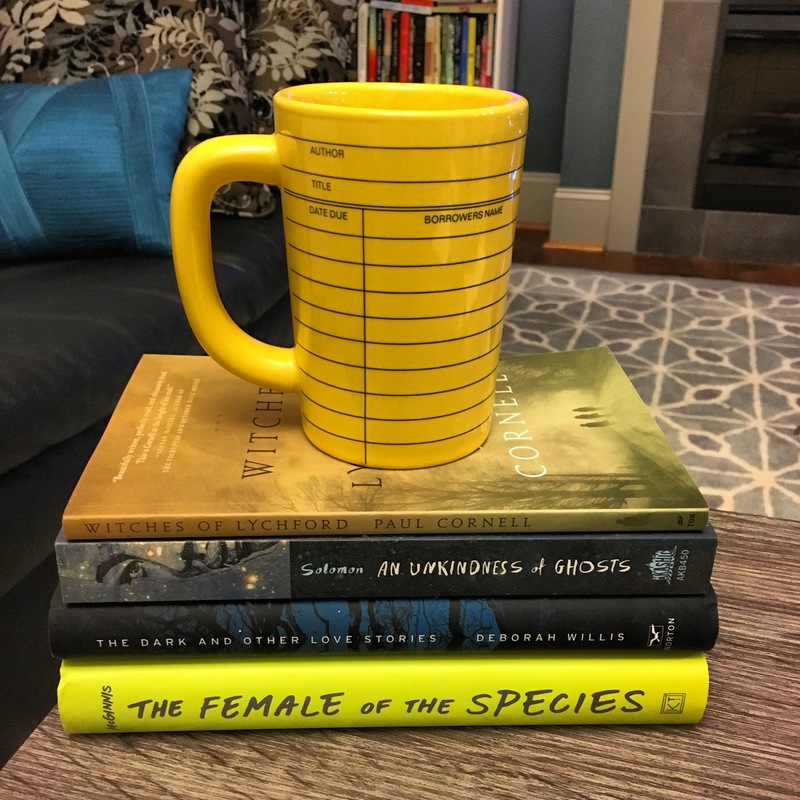 I’m also very interested in starting The Female of the Species by Mindy McGinnis, which follows three teenagers, one of whom I believe has the urge to kill? Possibly? And deals with issues of feminism as well. Lastly, for an audiobook option, I checked We Are Okay by Nina LaCour out of my library; it’s only five hours or so long and deals with a friendship/romance while one of the main characters is coming to terms with her grief. 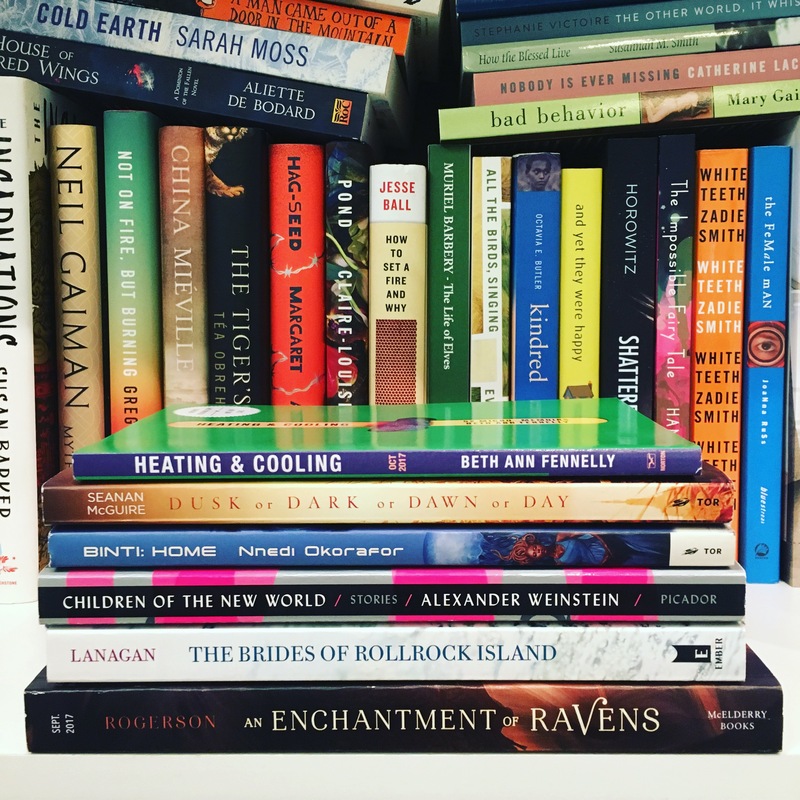 This round of Bout of Books has officially ended! Like several days ago, because I got way behind with my updates. On Sunday, I was really determined to stick to the goals I’d set for myself, and I had a much less busy day planned so I was actually able to get a lot of reading done. I read a bit during the day in between doing things around my apartment, and then met up with friends for Thai food and an escape room in the evening. The escape room was One Flew Over the Cuckoo’s Nest-themed, and it was a lot of fun–we actually ended up escaping much more quickly than we usually do, once we were able to track down the correct medication for the missing patient. Once I got back, I stayed up late finishing both Fierce Kingdom and Heating & Cooling. Fierce Kingdom actually ended up being a bit of a letdown, but I really enjoyed Heating & Cooling–it’s a perfect readathon read. Overall, I’m glad I accomplished my goals, but it was such a crazy week for me that I didn’t even feel like I was able to read that much. I also didn’t stick that closely to my TBR, and I think if I had I’d probably have enjoyed those books more than some of the ones I ended up reading. August has been a bit of a lackluster reading month for me compared to July (which was wonderful, I read so many awesome things!). I feel like having a stellar reading month last month set me up for failure a bit this month, but oh well! There’s always next month. My wrap-up post for August with reviews will be up in the next few days. I hope those of you participated had a great Bout of Books! On Thursday (day 4), I was able to get a lot of audiobook listening done while commuting and cooking dinner; I finished Too Fat, Too Slutty, Too Loud: The Rise and Reign of the Unruly Woman by Anne Helen Petersen and started a new audiobook, Blue Nights by Joan Didion. I’ve read one other Joan Didion book previously, The Year of Magical Thinking, which focused on the death of Didion’s husband and her subsequent mourning; Blue Nights is another memoir, which focuses on the death of Didion’s daughter. 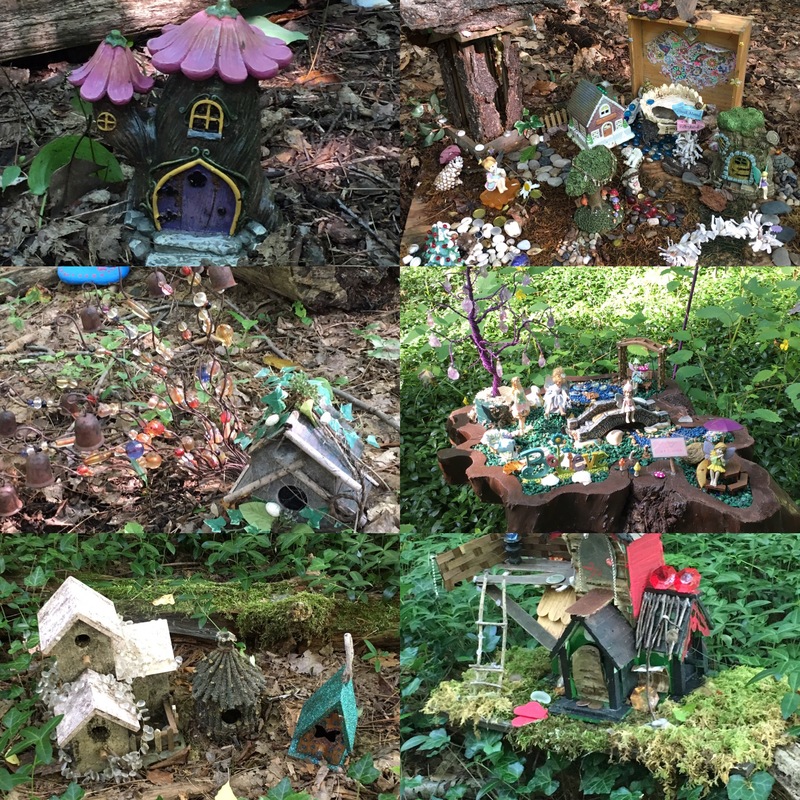 On Saturday, I had plans to take a day trip for most of the day to a town about an hour away that is home to a spiritual community of mediums; it ended up being such a gorgeous day and we found this adorable “fairy trail” where people have set up tiny fairy houses all along paths in the forest. My friends got readings done with mediums there, and we explored the community and shops while enjoying the beautiful weather. When I got home I met up with another friend I’d made plans with, but after that, I was determined to get some reading done! I couldn’t stand the idea of going two days during a readathon with absolutely no reading. So I read a decent chunk of Fierce Kingdom (I’d intended to finish it, but it didn’t end up happening; I wasn’t quite as invested in the story as I would want to be to binge-read the entire thing) and started Heating & Cooling by Beth Ann Fennelly; I had received an ARC copy from the publisher when I was at BookCon earlier this summer. I figured that Heating & Cooling would work well in a readathon because it’s extremely short and divided up into micro-memoirs, which range in length from a few sentences to a few pages. And I was right! It was the perfect way to switch up my reading, and I laughed out loud during several of the first few micro-memoirs. It’s officially time for Bout of Books! Three days in, I’d say this readathon is going pretty well, even if I haven’t read quite as much as I expected to at this point (I never do). I kicked off my readathon once it hit midnight Sunday night/Monday morning, which is how I prefer to start readathons, with An Enchantment of Ravens by Margaret Rogerson (I received an ARC at BookCon). So far, I’m all about it. There are fae, it’s creative, the main character is an artist, there are hints of darker tones and bits of darkness in fae/human interactions, and I like the writing style. I’m hoping this book will help tide me over until the next ACOTAR books start being released! On Monday, I was able to listen to a bunch of my current audiobook, Too Fat, Too Slutty, Too Loud: The Rise and Reign of the Unruly Woman by Anne Helen Petersen, during my commute and lunch break, and when I got back from an absolutely insane/terrible day at work, managed to start reading Binti: Home by Nnedi Okorafor after watching Bachelor in Paradise. (I know, I know, but it’s such fun trashy TV.) The reason I started another book instead of reading more of An Enchantment of Ravens is that I’ve been specifically saving Binti: Home for this readathon, and since it’s very short I wanted to it to be the first book I’d finish during the ‘thon. On Tuesday, I again audiobooked during my commute and lunch break at work, but ended up getting home later than I thought I would for the second day in a row. I’d intended on finishing Binti: Home on this day, but I was just too sleepy; I read another decent chunk of it before I had to give in and go to bed. Wednesday is my day off from work, so I was finally able to finish a book (yay!) by completing Binti: Home. I actually liked this one a lot more than the original Binti; things became more complex and a lot happened in a very short period of time. It definitely is a big lead-up to the third and final novella, however, and does end on a cliffhanger. I actually hadn’t known when I started it that it would be a middle book, but that’s OK; I really like this series and will definitely pick up book 3, Binti: The Night Masquerade when it’s released in January. I listened to a bit more audio while running errands, went to a library book sale (and bought soooo many books!) and then decided I was in the mood for something different, so I ignored my currently reading pile (which has 6 books on it) and my readathon TBR (because when have I ever stuck to a TBR?) 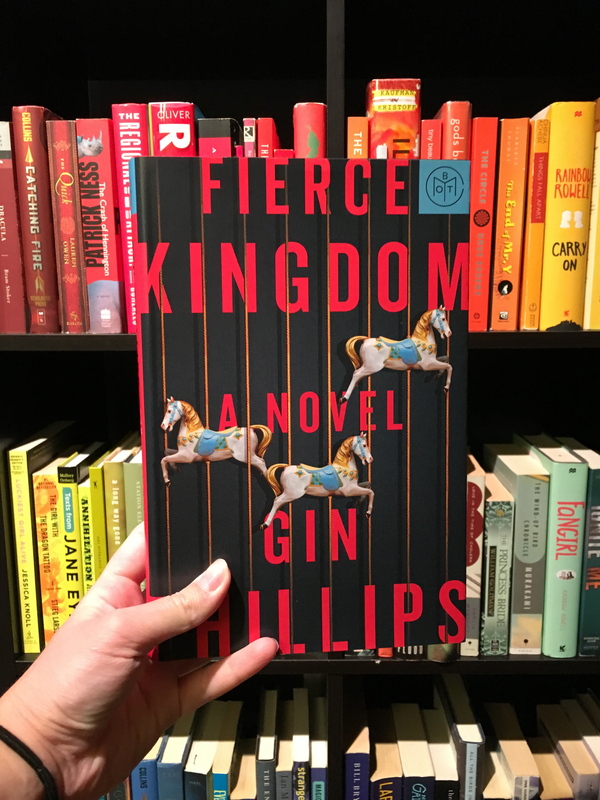 and picked up my Book of the Month pick for August, Fierce Kingdom by Gin Phillips. It’s a fast-paced, shorter suspense novel about a woman and her four-year-old son trapped at the zoo with a gunman, and takes place over the course of 3 hours. I figured that the fast pace of the book would help me pick up my reading pace since I feel like I’m a bit behind where I wanted to be midway through the week. How is everyone else’s Bout of Books going so far? Let me know in the comments! It’s almost time for Bout of Books, one of my favorite readathons! August has been a super readathon-ish month for me. Usually I do only one readathon per month, or more usually none at all, but this month I’m going straight from Tome Topple, which focuses on reading books longer than 500 pages, to Bout of Books, during which I typically focus on reading several short books. This round, I’m really hoping to read at least 3 physical books and 1 audiobook. I think that’s a solid goal. I’m planning on posting updates throughout the week here and on my Instagram account. Heating & Cooling by Beth Ann Fennelly (ARC) – I received an Advance Reader’s Copy of this collection of micro-memoirs from the publisher (W.W. Norton) at BookCon. It’s very short and I know very little about it, but I like the idea of jumping into something new during a readathon. I’ve never even heard of a “micro-memoir” before, but I like the idea! Dusk or Dark or Dawn or Day by Seanan McGuire – all I needed to know about this one was that it’s a Seanan McGuire novella about ghosts. Done. 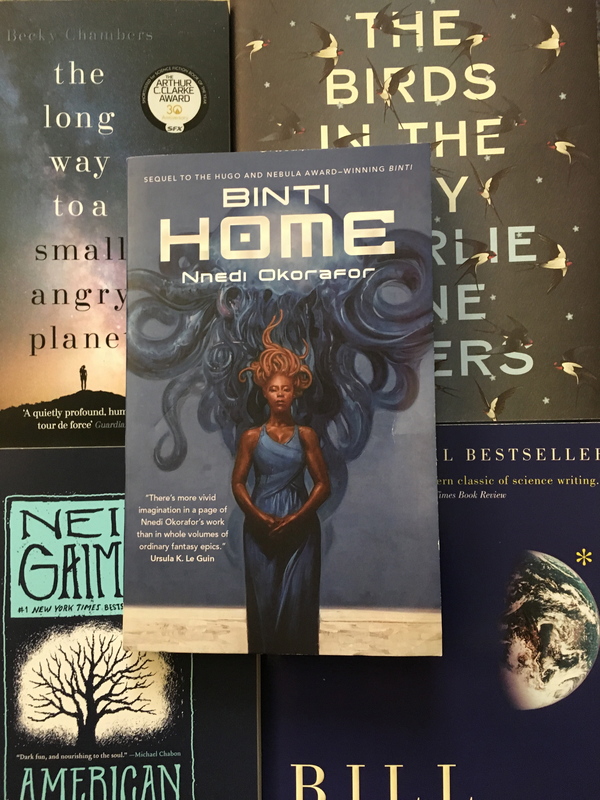 Binti: Home by Nnedi Okorafor – I read Binti for a previous readathon, and found that the pacing, plot, and the fact that it’s YA made it a perfect quick read. This sequel is longer and focuses on Binti’s return home to Earth after attending school on another planet, something that’s forbidden where she’s from. Children of the New World by Alexander Weinstein – I’m so interested in this science fiction short story collection and I hope I have time to at least start it next week. Short stories can be a great way to get in little chunks of reading during a readathon. The Brides of Rollrock Island by Margo Lanagan – I’m at the very beginning of this book, which focuses on a small island where men steal selkies for their brides and is sort of creepy and dark fairytale-esque so far. I really like Lanagan’s writing style. An Enchantment of Ravens by Margaret Rogerson (ARC) – I received an advance reader’s copy of this book from the publisher (Margaret K. McElderry Books) at BookCon as a happy accident–I just managed to be at the right place at the right time to get in line for a copy of this fantastic-sounding book. It sounds sort of A Court of Thorns and Roses-esque in a very good way; it’s released on September 26th. 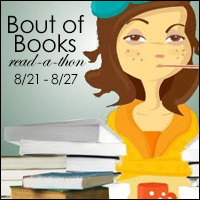 Who else is participating in Bout of Books??? I’m excited! So that’s a wrap for Bout of Books! It’s always fun to have a readathon going to help inspire you to read more than you normally would. I definitely wouldn’t say I got a crazy amount of reading done this week, but I think I did a decent job and most importantly have (for the most part) really enjoyed the books I chose. On Saturday, I had a very productive readathon day. I did have to work, but I listened to the audiobook of Trainwreck: The Women We Love to Hate, Mock, and Fear..and Why by Sady Doyle on my commute and also while running a bunch of errands afterwards, so my day was doubly productive. When I got home, I finished reading The Beauty by Aliya Whiteley, which turned out to be very good and even weirder than I expected it to be (which is a good thing in my book). It also had more plot twists than I anticipated, so I couldn’t have stopped reading it even if I’d wanted to. I meant to pick up another print book after that, but I started getting some things done around my apartment while listening to Trainwreck and couldn’t stop; it’s very short as far as audiobooks go, and the subject matter is super absorbing. I actually finished it late Saturday night and would highly recommend it to anyone looking for a feminist nonfiction read. Sunday was Mother’s Day, so I spent most of the day with my family and didn’t get quite as much reading done. I did start a new audiobook, Big Magic: Creative Living Beyond Fear by Elizabeth Gilbert, but only got a little bit into it. I also read a little more of Windwitch by Susan Dennard, which is slower-paced than I had expected. How did Bout of Books turn out for you guys? Let me know!